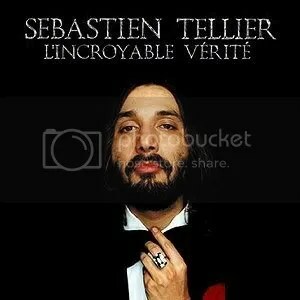 One of the first signings to Air’s Record Makers label after the success of their Moon Safari Lp, Sebastien Tellier’s first album is like a manic depressive cousin to Air’s sleek confections. Where Air seem to aim for perfection, Tellier aims for more sleazy and imperfect terrain. Sure, both have a love for intricate orchestration, harmony and the art of the soundtrack, but L’Incroyable Verite is a more troubled, introspective affair. If Moon Safari was the night of the party, L’incroyable verite is the dirty aftermath when you wake up in unfamiliar surroundings and trudge home with only a hazy sunrise to greet you. The beauty in these instrumentals is a moody echo of parties past and the feeble attempts to recreate a magic that escaped your grasp only hours ago. Air serve as tellier’s backing band on this album and they seem to relish the opportunity to explore different shades of their musical palette. My only complaint is that Tellier’s breathy, depressing vocals are only used spaingly in favor of mournful horn arrangements and slow-motion chord progressions. Everything is one big hangover where each note is played so gently so as to not disturb this incessant downer. At times, it even sounds like some forgotten prog gem as it gets lost in a reverie of synthesizers and nearly medieval melodies, but L’Incroyable Verite is one of those weird albums that seems to borrow so much, yet seems totally unique in its own way. It’s hard to imagine that it was released in 2001 since it seems to truly belong to another era.